Product Description Cashews are roasted before being ground to a smooth texture. Dietary Attributes Gluten Free, Dairy Free, Yeast Free, Refined Sugar Free, Egg Free, Vegetarian, Vegan, Wheat FreeSoya Free, Fish Free, Shellfish Free, Sulphite Free, Celery Free, Mustard Free, Lupin Free, Mollusc Free, GMO Free, Additive Free Use Delicious as a spread or use as a cooking ingredient. Product Description Cashews are roasted before being ground to a smooth texture. Dietary Attributes Gluten Free Dairy Free Yeast Free Refined Sugar Free Egg Free Vegetarian Vegan Wheat FreeSoya Free Fish Free Shellfish Free Sulphite Free Celery Free Mustard Free Lupin Free Mollusc Free GMO Free Additive Free Use Delicious as a spread or use as a cooking ingredient. Ingredients Roasted Cashew Nuts (96%) Organic Sunflower Oil. 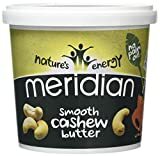 This entry was posted in Buy Supplements and tagged Butter, Cashew, Meridian, Smooth by TOSMS. Bookmark the permalink.